Albert Hofmann (11 Januar 1906 – 29 Aprile 2008) wis a Swiss scientist kent best for bein the first person tae seenthesize, ingest, an learn o the psychedelic effects o lysergic acid diethylamide (LSD). Hofmann wis an aa the first person tae isolate, seenthesize, an name the principal psychedelic mushroom compoonds psilocybin an psilocin. He authored mair nor 100 scienteefic airticles an numerous beuks, includin LSD: Mein Sorgenkind (LSD: My Problem Child). In 2007, he shared first place, alangside Tim Berners-Lee, in a leet o the 100 greatest livin geniuses, published bi The Telegraph newspaper. 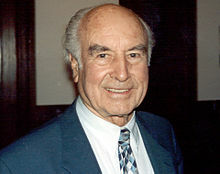 ↑ "Albert Hofmannf". Multidisciplinary Association for Psychedelic Studies. Archived frae the oreeginal on 30 April 2008. Retrieved 29 April 2008. ↑ 2.0 2.1 "Obituary: Albert Hofmann, LSD inventor". London: Daily Telegraph. 29 April 2008. Archived frae the oreeginal on 1 May 2008. Retrieved 29 April 2008. ↑ Hofmann, A. "Psilocybin und Psilocin, zwei psychotrope Wirkstoffe aus mexikanischen Rauschpilzen." Helvetica Chemica Acta 42: 1557–1572 (1959). ↑ "Top 100 living geniuses". The Daily Telegraph. London. 30 October 2007. This page wis last eeditit on 23 August 2017, at 20:19.